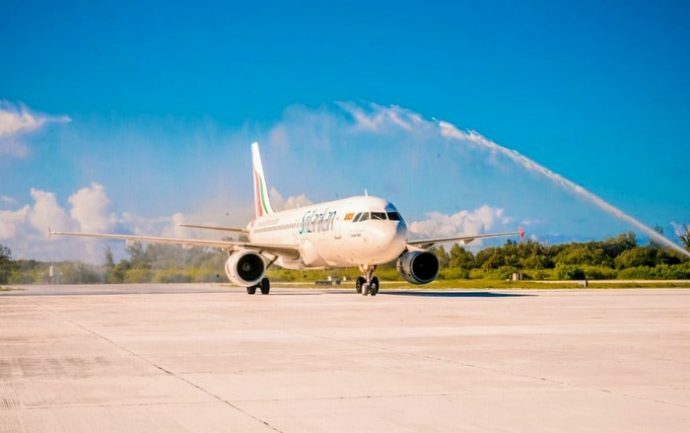 SriLankan Airlines has announced plans to increase flights to the Gan International Airport in the southern part of Maldives. Neighbouring SriLanka’s flagship carrier began scheduled flights to its second destination in the Maldives in December, becoming the only airline to operate scheduled international flights to a destination other than the main Velana International Airport. The airline currently operates four weekly flights to Gan from Bandaranaike International Airport in Colombo. An official from Ace Aviation, SriLankan Airlines’ General Sales Agent in the Maldives, told state run Public Service Media (PSM) that the airline would add two more flights to its Colombo-Gan route starting September 17. It would increase frequency on the route to six flights per week, he added. Gan International Airport is located in the southernmost Addu, which is home to Shangri-La’s Villingili Resort & Spa and Canareef Resort Maldives, and two city hotels. The airport recently underwent a major renovation project that saw expansion of its runway and upgrading of its facilities. SriLankan Airlines’ plans to expand Gan operations follows a similar announcement earlier this month to increase flights to Velana International Airport. With the announcement, the airline now operates a total of four daily flights to the Maldives’ main gateway. SriLankan Airlines is particularly popular amongst tourists who travel to the Maldives from Europe. Expanding operations to Gan International Airport by a major international airline, which has also recently won the Leading International Airline to Maldives title at the prestigious Maldives Travel Awards, is expected to give much needed boost to tourism in the southern part of the Maldives.